Puddles of Myself: Pop Goes My Heart: David Stern Analyzes Gotye's "Somebody That I Used to Know"
The Stern Man, David Stern, takes off his podcast robe and slips on his Guest Columnist undergarments to dissect the pop merits of Gotye's "Somebody That I Used to Know." Over the past week or so, you may have experience the Facebook/Twitter/DropBox/online phenomenon that was Gotye's pop hit, "Somebody That I Used to Know." The Puddles of Myself team, constantly monitoring what is "good" in the world decided we needed to weigh in. So, we turned to lead singer and songwriter of The Sanctuaries (@sanctuariesnyc), David Stern, to provide his infinite musical knowledge to explain why the song is so successful as a pop hit. If you’re like me then you’ve experienced an oft-annoying phenomenon that has you listening to the same song over again on repeat. I can think of countless tracks that have held entire days hostage; hell, I even listened to the first thirty-three seconds of George Harrison’s “Wah Wah” exclusively for an entire week. So what is it about certain songs that call for repeated listening? In the case of “Wah Wah,” I can tell you that I simply fell in love with the delivery and sound of the initial vocal line that follows the song’s expository musical elements. In other cases, the reasons behind hitting that play button again and again are not so easily recognizable. Gotye’s “Somebody That I Used to Know” is not a song that I would normally like. In fact, I hardly like it. I find its verses muttered and lacking anything substantial to hang on to, while the actual lyrics—the reaction to being cut-off after the end of a relationship that the singer didn’t even need in the first place— are “highschoolian.” Ostensibly, people the world over are listening to it. Maybe they can actually relate to the lyrics? Maybe they simply find it catchy? I hope fate has other things in store for Gotye but his breakthrough song has all the makings of a “here today, gone tomorrow” sort of thing. People will praise it because it’s really not a bad song, its chorus is pretty damn catchy, and audiences will feel the sympathetic buzz of everybody else listening to it. But can another Gotye song possibly live up to this one’s hype (“Hey There, Delilah” ring a bell?)? Regardless of his career arc, the reaction to this song has been overwhelming; somebody even suggested that I give it a listen before they themselves heard it. So what makes Gotye’s “Somebody That I Used to Know” this week’s song on repeat? In my opinion it comes down to two things: structure and a very clever trick. Many people assert that structure is what made Beatles songs so listener friendly. As I’m sure you’ve heard the saying, “leave the audience wanting more,” the Beatles catalog—for the most part—is a study in brevity. Between Rubber Soul and Revolver, two albums that were considered experimental for their time, there are only three songs that clock in at over three minutes. I remember listening to Blur’s “Song 2” about a thousand times before realizing that its magic lay in the fact that it was just over two minutes long. But “Somebody That I Used to Know” is by no means a short song. At just over four minutes, it is about thirty seconds too long to be considered an ideal pop track. Yet its structure is what leaves you wanting more. The golden formula for pop song structure—barring the thousands of exceptions—is verse/chorus/verse/chorus/bridge/chorus. It can be heard literally any time you turn on the radio. In fact, Jessie J’s “Domino,” the last song I heard in my car today, employs this structure (with some pre-choruses). While the track is pretty catchy, it doesn’t leave me wanting more. Gotye, in his breakthrough song, forgoes this formula for what I think leaves the listener in a state of just that. Instead of hitting the chorus right after the first verse, the song builds on the introductory musical elements and begins a heightened second verse. By the end of this, the listener is practically begging for that change—the chorus—and they get it. The second iteration of a verse precludes the need and, more importantly, allotted pop-song time for a bridge. So after the first chorus, we have the third verse (which I will get to later) and then the second and final chorus (extended, with an outro). Here is where the hook comes in. We have a four-minute song but only TWO choruses. Upon listening to the song for the first time, we get a verse, a bigger verse, an expected chorus that familiarizes us with the song’s catchiest elements, another verse, and then the last chorus. Our trained ears are left in need of that third chorus, which, of course, never comes. Repeat. If you’ve heard the song you don’t need me to tell you about the clever trick that happens in that third verse, but I will anyway. 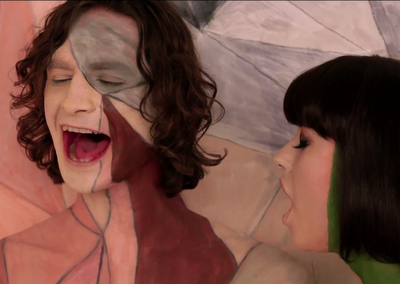 In the third verse, Gotye forgoes his vocal responsibilities and has a girl, Kimbra, sing. This serves a dual purpose: it makes the twice-already-played verse more listenable by introducing a new timbre (the female voice) and gives the listener the other side of the break up. It lightens the load on the audience’s ears and turns the song from a whiny monologue to a conversation. The female voice is then used to kick the second chorus up a notch. While “Somebody That I Used to Know” is not a short song, its less-than-a-handful of elements definitely leave the listener in a state of need, not to be confused with being unsatisfied. And although it is just one among thousands of tracks with its exact structure, one can’t deny its catchiness or popularity. Only time will tell if Gotye has what it takes to be remembered as the writer of hits or if he will eventually be thought of as the singer of a song we used to know.